Ticket King Milwaukee will have Kid Rock and Sheryl Crow Summerfest tickets available for their July 3rd show at the Marcus Amphitheater. Kid Rock and Sheryl Crow are the latest artists to be added to the Marcus Amphitheater lineup for this year's Summerfest. 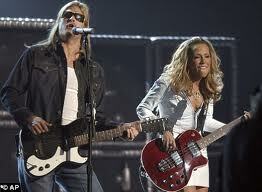 Sheryl Crow has proven to be a Summerfest favorite as she has performed on free stages for the past couple of years. This latest announcement means that there are only two more shows that are yet to be announced for this year's Summerfest lineup. Who will fill up the last two available slots at the Marcus Amphitheater? We've been talking a little bit about it today on Twitter and I have some guesses. I'm thinking, Adele, New Kids on the Block with the Backstreet Boys, Britney Spears, the American Idol Tour, or the Glee tour. Who do you think will perform at the Marcus Amphitheater during this year's Summerfest?